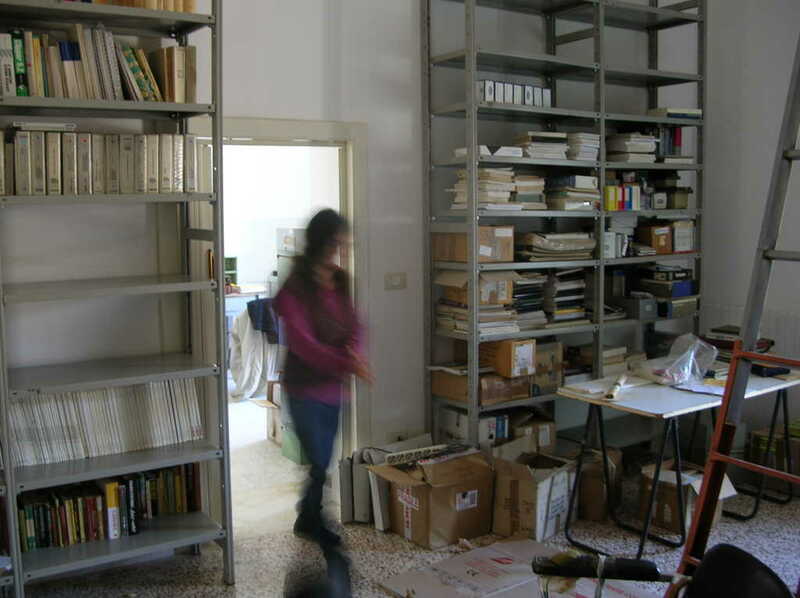 We have a storage facility, called “il deposito” (the deposit), and a library for books and paper, with a media storage for software and media. The deposit has always been a central point in our last years, especially at a time when we did not have a home for the Museum. For years we stored our pieces in a garage, made available from Paolo Orecchia, one of our brothers and fellow adventures, to which we will never be grateful enough and to whom we owe our existence; this allowed us to survive and save a lot of material over the years, things that otherwise would have been lost. In 2011, unfortunately, we faced a number of logistical problems that made us fear the worst: the risk of seeing all our material fraudulently stolen or, worse, sold as scrap. So we decided to rent a new place, with our forces alone, stopping waiting for aid by the institutions, which never made it all these years. So we had courage and, in November 2011, with the help of many volunteers, friends and brothers, we were able to deliver and rescue all the material into the warehouse of the museum. The new Depot is a very large room, dry, with constant temperature and humidity, featuring massive shelves (donated by Antonio Garozzo, among witha lot of historical material in our Museum). Here we keep all the material that, for reasons of space, we can’t directly exhibit in the Museum; our idea is first to preserve, assess, restore and archive all items (computers, peripherals, hardware parts, accessories, etc. .) Visiting the Deposit is always possible, even computers can’t be directly used in there, due to restriction of space and conservation procedures. Our general archive database is still under construction. The Library is the place where we keep all manuals, documentation, diagrams, all paper related to computers we have in the museum, but also relative to machines that we don’t have. It collect about 4000 pieces, including technical manuals, books, computer science and technology publications, magazines, diagrams, documents, vintage brochures, and printed materials of various kinds. We also have a Microfiche reader and a collection of microfiches about computer science magazines. Media Audio readers (4 track reel, audio of various types, DAT, MINIDISC, etc.). Media Video readers (VHS, Video, Hi8, VHS-C, Umatic, BETAMAX, Video2000, etc.). The purpose is to rescue operating systems, programs, software, and data accompanying the magnetic systems of our Museum, as well as any audio-visual materials of historical interest. This is one of the most important aspects of our research because the ability to read, retrieve and save data from different obsolete format is for us a source of great pride. The restoration work is carried out using restored and refurbished equipment, special computers configured specifically for this task, and dedicated modified software, a part of which was adapted or written by ourselves for the best results. With our expertise, research continuity and a decent spare part backup, we are also specialize in recovering data from damaged, obsolete or defective media.